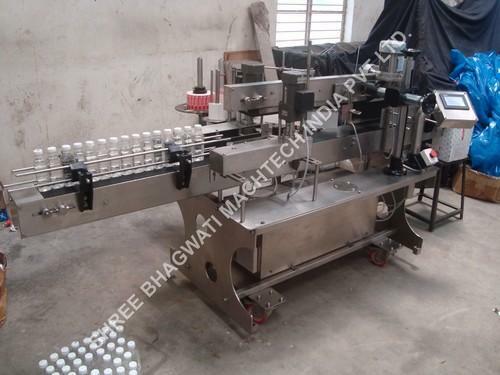 Bhagwati labeling machine is most user friendly. The Machine incorporates latest sophisticated Micro Processor Control Label Dispensing system with user friendly Sensing system for Label and Product. The machine is suitable for Labeling on Round Vials, Small Sizes of Bottles and other round objects. It is capable of Labeling up to 150 units per minute depending on product diameter and label size. Machine suitable for Vials and Small Sizes of Bottles from Glass, Plastic, PET, HDPE, PP etc. The Sticker Labeling Machine Model-120 has its own unique single point synchronized speed control system.